I have seen many changes in my lifetime, but one of the most amazing things to me is the awesomeness of the exploration of outer space and that man actually landed on the moon. I remember watching the television broadcast when Walter Cronkite reported that the astronauts had landed on the moon…it just seemed unbelievable. A second amazing thing would be the computer and all that is possible with its use. It’s still hard for me to comprehend that you can contact someone by email and all the facts and information that are available on the Internet. I don’t know whether I will use it, but I recently got an email address. 2. How has your daily life/routine changed from the time you were in your 30s and 40s? The three greatest changes in my daily life/routine are that I am now a widower, my children are grown and I am retired. My wife Zola and I were blessed with five children. We had 3 daughters and 2 sons, including twins. Our last child was born when I was 42, so you can imagine we were very busy parents. I didn’t believe that caring for the children was solely the mother’s responsibility, and I tried to help Zola as much as I could. We were a team in so many ways and had a loving and fulfilling marriage of 62 years. It has been a major change to lose my life partner and I miss her. I was a pastor of two churches when I was in my 30s and 40s and my days and evenings were often full. When I reflect on my daily life today it is more relaxed, less hurried and I have considerably fewer responsibilities. The pace is much slower. On one hand I have more freedom. Most days are mine to do with as I choose. I enjoy reading, writing, talking with my sister on the phone and getting together with friends and those from my church for special luncheons. But there is also less freedom. Giving up driving was very difficult. Now I am dependent on my daughter to take me places. I miss the independence of driving when I want to go somewhere. 3. What made you decide on the profession you chose? Foremost, I prayed about it! I’ve always had an innate love for the church. When I was 26 my pastor asked me if I had ever thought about the ministry, and I told him yes. While I had held previous jobs, I clearly felt called to become a minister. Giving in the servant role appealed to me more than getting for personal advantage. 4. Did you have any financial struggles along the way? If so, how did you manage through them? What helped you be financially sound? In my day, churches were behind in salaries for pastors. There were times when we just had to do without some things. I was fortunate to have a wife who shared the same belief about not spending above our means. We made a budget and kept within it. It wasn’t easy. We always had a large garden and Zola did a lot of canning. Our parishioners would share extra produce from their farms. I didn’t like credit cards and have never had one. We were a one income family until Zola went back to college and earned a Master’s Degree in Education when she was 50 years old. She then began teaching as an elementary teacher. Fortunately her salary enabled us to send our children to college. No matter how much money we had, we always tithed our income (to the local church). 5. What activities have you found most enjoyable through the years? My younger brother James and I began signing together at a young age. He played the mandolin and I played the guitar. We sang at county fairs, family reunions, community events and even on the radio three times. I can’t tell you how many times we sang together through the years but it was something I always enjoyed. In 1958 Zola and I, along with our five children, began a family tradition of recording an annual Christmas tape. We sang Christmas carols, read Scripture and everyone would share about the special events in their lives during the past year. When the children got older, one of them would also add a few jokes. We continued to make a family Christmas tape until 2007 when it became impossible for everyone to get together. Attending family reunions as a boy and, after being married, going to the family reunions on Zola’s side of the family. Being able to attend the Church of the Brethren annual conferences in the summer. Composing songs for men’s chorus groups and singing with the group in church. Watching Indiana University basketball games. Being a diehard Cubs fan. I have listened to many Cubs games on the radio or television, and I saw my first Cubs game at Wrigley Field in 1930. The last time I was at Wrigley Field was in 2002. If the Cubs are going to win a World Series in my lifetime they better hurry! 6. How do you feel you have made an impact on people? I hope I have made an impact on people by the Christian life I’ve tried to live. I also hope that my preaching and counseling has helped others. Music has always been an important part of my life. I have enjoyed playing the guitar and singing and writing songs for men’s chorus groups. People can be reached in different ways. Perhaps a song I have sung or written has made a positive impact on someone. 7. Is there anything you regret or wish you had a chance to change? Yes! I wish I had married earlier. Both of my parents died at a younger age, and I have thought if I had married earlier perhaps our children would have been old enough to have known their grandparents. They missed having a relationship with grandparents. However, if I had married earlier, I wouldn’t have met the love of my life, Zola. No doubt it was God’s plan that we were to meet. I also wish I had started earlier in the pastorate. I was about ten years older than many of my classmates at seminary. While I may have gotten a later start as pastor, God has blessed me with many years of good health and the physical ability to still preach at 100. Finally, I do wish my wife and I and the children had traveled more. It is so easy when you are younger to think you have plenty of time to do certain things. 8. Who have been the people who influenced you the most and why? There have been many people who have influenced me in my lifetime including the pastors and evangelists that I heard preach when I was a child and young man, along with my college and seminary professors. They were so knowledgeable and the enthusiasm they expressed in their preaching and teaching made me want to learn more. I developed a passion for reading and studying that continues to this day. I would have to say that it was my parents and grandparents who had the most influence on my life. The values and teachings I learned from them clearly helped shape my life. My parents were strong Christians who lived their faith. They knew great sorrow in their lives, losing 4 or their 7 children. Three did not live beyond the age of 4 and my older brother died of tuberculosis when he was 28. I learned a lot about adversity and how important faith was during times of grief and loss. My dad had a deformed foot that made walking difficult for him. I never heard him complain or even talk about his disability. My parents valued honesty and integrity and were hard-working people. I grew up during the Depression, and my parents taught me to appreciate and be grateful for what I had. Throughout my life it has never been material possessions that were the source of my happiness and contentment. My mother was only 57 when my dad died, and she worked in the post office and as a clerk in the general store. She also took care of my grandmother in her later years. I lived with my grandparents quite a bit of the time when I was growing up to help them on the farm. Life on the farm helped me appreciate the growing and harvesting of crops and taking care of animals. Grandpa and grandma were also very committed Christians and faithful in their church attendance. Hard work was no stranger to them. My grandpa was an easy-going man of great patience who seemed to take life in stride. Grandma worked hard in and outside the house. She could handle a team of horses better than grandpa! 9. What is one piece of advice you would give someone who is searching for direction in life? My advice is to pray for direction and be open to life’s possibilities and where God may lead you. Seek to discover your interests and gifts. [Update: 2/7/2017] Grandpa is still going strong. Today he preached again in front of a full chapel at the retirement community where he lives – just a week shy of his 104th birthday! He continues to inspire not only our family but those who hear him speak. Questions: Do you know a centenarian? What’s the big legacy you want to leave behind? How are you living today to make that happen? What would you hope to accomplish if you were granted 100 years of life? Anything from this interview stand out or speak to you? This is absolutely inspirational! I hope to practice gratitude every day of my life – and hopefully it’s a long one like your grandfather’s! Thanks Lisa. The world would be a much better place if we all were a bit more thankful for the things we have. Oh Brian, such an amazing man. You are so blessed to have him in your life. Thank you for sharing his story with us and to your grandfather for sharing his wisdom with us. I can hope that we are all blessed with such a long, joyful life as he has been. Beyond knowing him myself, I’m glad all four of my children will have a memory of him. Something about generational connections are important to a child’s development. What a great post, and what an awesome man. I’m a huge cubs fan… it’s inspiring that he made it so long as one! here i am at work and I’m moved to tears – thank you for sharing! I think the one thing that resonated with me (probably because it’s our passion) was wanting to travel more. I hope we never lose sight of our sense of adventure, no matter how our family grows. He sounds like a phenomenal man to know – thank you again for sharing. I agree on the traveling…that really stood out to me as well. My wife and I are committed to making that happen more and more while we still have our kids at home. I’m a Cincinnati Reds fan myself having grown up in southwest Ohio. However, I’ve found myself secretly rooting for the Cubs over the years (to no avail) simply because I know how much joy it would bring to him if they won a World Series. What a great role model to have! Hearing someone who has led such a rich life say he wished he’d traveled more makes me think I am not crazy to have such big travel dreams with a small child. I love your Grandfather’s attitude about life. Thanks for sharing. I’m glad you picked up on the travel theme Kim…that really stood out to me. The whole concept of traveling with our kids now is something my wife and I are becoming more and more committed to doing. Wow I really enjoyed this. I’m only 43 and have been amazed by the changes in technology…I can’t imagine being your grandfather and what he has seen. I think there are some great lessons to be taken away here…especially worry less. The big one that hits me is him living through the Great Depression. I know our country has hit hard economic times recently but it still doesn’t compare with what those people went through. This was a really nice read. It’s incredible to think about what our society has accomplished in the last 100 years. He sounds like such a sweet, gentle soul. It’s great that he’s still preaching and playing songs! In all the years I’ve known him I’ve never seen him get upset or angry. I’m sure it happened but never in front of us grandchildren. Worry less… that is great advice. Sounds so simple but it isn’t. I’ve had a stressful morning and feel like that was just the reminder I needed. I loved reading this! That’s really encouraging Liz that you found this post during some stressful moments this morning. You’re right…worry can eat us up if we let it. I’ve found almost all the things I worry about never unfold in the future the way I project they will. I always think about how much the world has changed in 100 years, I can’t imagine having lived through all of that. Makes me wonder how much more is ahead in our lifetimes. I’m sure people in 1914 had no clue that space travel would happen or that I’d be able to communicate with you like this on a blog. I wonder what groundbreaking, society-changing events my grandchildren will witness in the years to come. What a great and encouraging post Brian! It’s obvious that your grandfather has quite a gift and can only imagine the impact his convictions and servant heartedness have had on your family – and the families of many more. There’s really no way to calculate it. He’s been in at least 4 churches I know of full-time and others part-time in his later years. Awesome. It sounds so simple and obvious, especially for someone in ministry. But folks with that kind of integrity and character are hard to find. EVEN in ministry. That caught my attention as well Chaz. For me, that’s the money quote of the whole interview. It completely describes his life. That’s amazing. I can’t imagine living 100 years! It sounds like his life has been a gift that he is intent on sharing. That was the theme of his song…just a little bit longer to share his life and ministry with others. I love those 3 challenges right at the top! What a cool conversation and what a smart, down to earth guy. Thanks for sharing Brian! I think if we just did those three things in life we couldn’t go wrong. Your grandfather sounds like a wonderful man Brian, and he doesn’t look a day over 80! I hope you get to enjoy his presence for many more years. I didn’t realize how important grandparents were until I lost the first set. The other two are still alive and healthy and I have learned so much thanks to them. His influence has trickled down through the entire family, even now to the great-grandchildren who’ve had a chance to get to know him. What an amazing and inspiring man. Great to read his words and a huge belated Happy Birthday to him from moneystepper!! He has been that to our entire family. 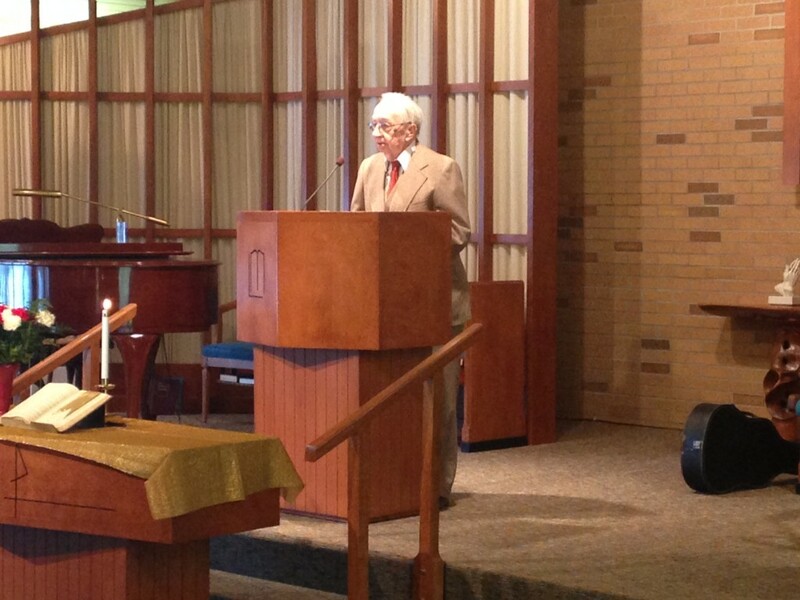 Even at 100, his presence and passion in the pulpit is powerful.